Just got home from having drinks with three people I used to work with at another government department. We all successfully escaped that place. We went to a bar that I used to frequent quite often but haven't been to in about 4 years. It hasn't changed much so it was quite familiar. And it was happy hour so I had 3 beers for $10.29! The last time I wore this blouse and boots I ended up wrangling chickens in the country. After yesterday's snow, I wanted to wear something bright and sunny. I'm not sure this colour does much for me but it's nice to think "I'm wearing GIVENCHY!" And with a Reitman's skirt that probably cost me $15.00. I think these boots look a lot better on my feet than they do sitting in my closet. They really look kind of yucky when not being worn or combined in an outfit. My Fluevog nemesis Rebecca (and I mean that in only be most good natured way), Winnipeg style, wears them awesomely in this outfit so I also paired mine with green tights. I probably wouldn't have posted this outtake if I wasn't a tiny bit drunk. Someone walked into the kitchen just before the timer went off. This will forever be known as my DERP face. I'm now off work until the 28th. I'll be posting sporadically until then. Some Fluevogs are like that - they look so much better on! I love these yellow ones and keep hoping I'll score some on consignment to replace my Big Bird boots. Oh, that is a great plaid, and an adorable outtake! Glad it all turned out ok with the chickens last time - I love my hens, but there is no wearing Fluevogs to the coop. Your boots are very beautiful. Aww! The cutest boots in the world! I'm still pissed I resold the Jean boots from the Time family. They were that exact shade of yellow. Enjoy your time off! I'm back to the grindstone tomorrow with classes. Boo! I really love the top! It's plaid and yellow so it makes me smile! And I love your outtake picture, it's cute! Enjoy your time off!! I know it's much needed! I love it! That yellow is tricky but you really work it, and it looks great! Gorgeous yeallow top and boots, megan. I LOVE the outtake pic! More please! And I love the yellow, both the Givenchy and the boots. I think we should follow each other! Fluevog Nemesis! Hilarious! You are too cute! 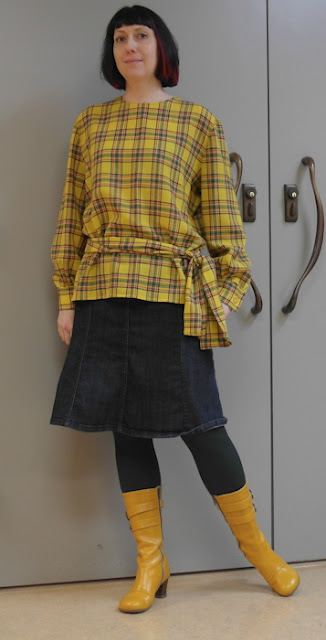 I just love the way you styled your Mirella's with the vintage plaid blouse! Really lovely outfit! Hope you have a fantastic vacay! The outtake photo is my favorite! You've got such a sweet smile! I also adore those boots.